The Prem Sagar was one of the first books published in modern Hindi. It is the tale of the deeds of Krishna, the invincible avatar of Vishnu. 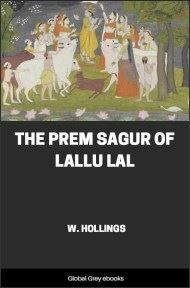 Based on the tenth book of the Bhagavata Purana, the Prem Sagar, which means 'Ocean of Love,' (one of Krishna's epithets) was composed by Lallu Lal between 1804 and 1810. 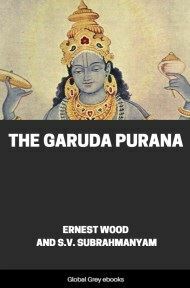 Now is the commencement of the history.--At the end of the great war of the descendants of Bhurut, when Shree Krishnù disappeared, Pandoo being greatly grieved went to the Himalaya to undergo dissolution; and the Raja Pureechit having conquered all countries, began to rule with justice.--Some days afterwards, the Raja Pureechit went out hunting, when he saw a bullock and a cow running towards him, in pursuit of whom a Soodrú with a wooden pestle in his hand was coming along and striking them. When they came near, the Raja grieved and enraged, called out to the Soodrú, who art thou, explain who thou art, that knowingly beatest a bullock and a cow; do you suppose Urjoon to be far off, that you do not observe his ordinances? Hear me, in the family of Pandoo, you will not find any such person, in whose presence any one will be permitted to vex the poor. 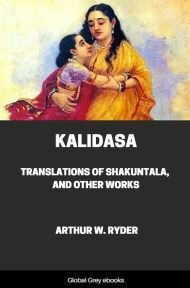 Saying this, the Raja took his sword in his hand; the Soodrú on seeing this, stood still with fear.--The Raja (the lord of men,) having called the bullock and cow near him, enquired of them, explain to me who you are, are you gods or Brahmins, and why are you running away? Speak without fear, in my presence no one has the power of afflicting you. On hearing this, the bullock bending its head said, "O great king! this black coloured, frightful figure in the form of Sin, which is standing in your presence is the Black Age, I am running away on account of its approach. This, my companion, is the earth in the form of a cow; she too has come running towards you from dread of the Black Age. My name is Religion: I have four feet--penance, truth, compassion, meditation. In the Age of Truth my feet were complete--consisted of twenty parts; in the Treta Age, they consisted of sixteen parts; in the Dwapur Age of twelve; and now in the Black Age, I have only four parts left, for which reason Ian not able to move about in the Black Age." The earth said, "O incarnation of justice! I also cannot remain in this age, because men of the Soodrú caste, having become Rajas, will inflict very many acts of injustice on me, the weight of which I shall not be able to endure: from dread of this injustice, I too am running away." On hearing this, the Raja, being angry, said to the Black Age, "I will put thee to death immediately." On hearing this, the Black Age falling at the Raja's feet, and imploring him earnestly, began to say, "O lord of the earth! I have now come under your protection, appoint me some place to dwell in:--because the three times and the four ages, which Bruhmù has established, shall not be effaced in any way." Hearing this, the Raja Pureechit said to the Black Age--"Dwell in the following places, in gambling, lying, in the spirit market, harlots' houses, murder, theft and gold." 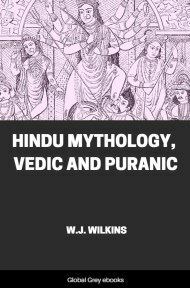 Having heard this, the Black Age went to his appointed abode, and the Raja established Religion in his own mind; the earth assumed his own form, the Raja returned to his own city, and began to govern justly and religiously. After some days, the Raja went again to hunt, and whilst engaged in the sport, became thirsty. The Black Age was dwelling in the golden crown on the Raja's head, and having obtained his opportunity, deprived the Raja of knowledge. The Raja from thirst came to the spot where Lomus, a chief of the saints, was seated with his eyes shut, meditating on Muhadeo, and engaged in religious penance. On seeing him, Pureechit began to say to himself, this person through pride of penance remains with his eyes shut, although he saw me. Entertaining this wicked idea, and having raised up with a bow a dead snake which had fallen there, and thrown it on the neck of the chief of the saints, he came home. On taking off his crown, the Raja recovered his knowledge, and reflecting began to say, the abode of the Black Age is in gold, he was upon my head, and this is the reason of my having performed so vicious an act, as throwing a dead snake on the neck of a chief of the saints; I now know, that the Black Age has taken his revenge upon me; how shall I escape from this great sin; why have I not been deprived to-day of my caste, wealth, family, wives and kingdom--I know not in what birth, this injustice of my having vexed a Brahmin will be effaced. Whilst the Raja Pureechit was drowned in this sea of unfathomable reflection, some boys engaged in play came to the place where Lomus, a chief of the saints, was:--they were astonished at seeing a dead snake on his neck,--and being frightened, began to say to each other, "Brother, let some one go and tell his son of this, who is playing with the saints' children in the grove on the bank of the river Koushkee." One of the boys hearing this ran to where Shringee the saint was playing with the saints' children.--The boy said to Shringee, "Brother, why are you playing here; some devil has thrown a dead black snake on your father's neck and gone off?" On hearing this, Shringee's eyes became red--gnashing his teeth, he began to tremble; and, being enraged, to say--"In the Black Age proud Rajas have been produced: from the intoxication of wealth, they have become blind and inflicters of pain: I will now pronounce a curse on him, who threw the snake, he shall die on the seventh day from this." Having thus spoken, Shringee the saint took the water of the Koushkee river in the palm of his hand, and pronounced a curse on the Raja Pureechit, that the snake would bite him on the seventh day. 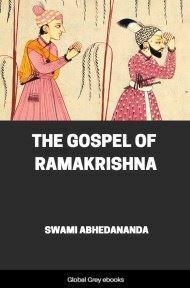 Having pronounced this curse on the Raja, he came to his father and took the snake from his neck, and began to say to him, "Father, be of good cheer, I have pronounced a curse on "him, who threw the dead snake on your neck." On hearing this, Lomus the saint, awaking from his meditation, opening his eyes and deeply considering in his mind his son's speech, said to him, "O son! what is this thou hast done why have you pronounced a curse on the Raja, under whose government we lived at ease; not a bird, nor a beast even was afflicted.